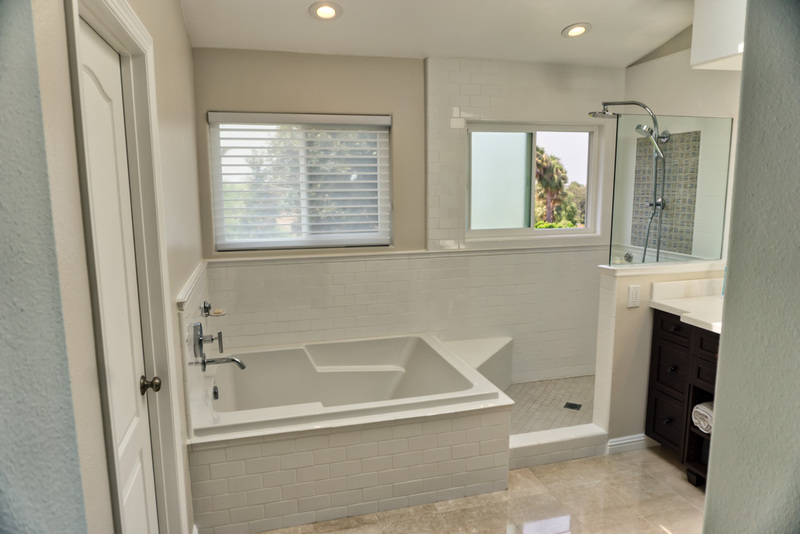 This project was precipitated by a failing shower in this two-story Oceanside home, originally built around 2000 and acquired by our clients as a bank-owned foreclosure property. The couple had not used the shower for quite a while because they noticed water damage in the ceiling of the room directly below shortly after purchasing the home. They thought it was a leak in the valves or pipes, not realizing the true real problem was in the waterproofing and drain. 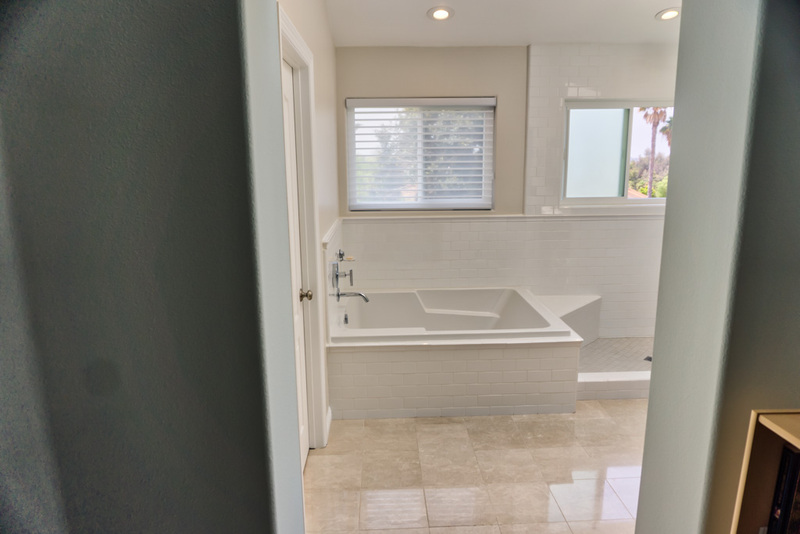 They knew that to fix the leak they would need to demo the entire tile shower and tub area, and so they decided to wait until they had the money to do a remodel instead of just a costly repair and get the most out of their money. 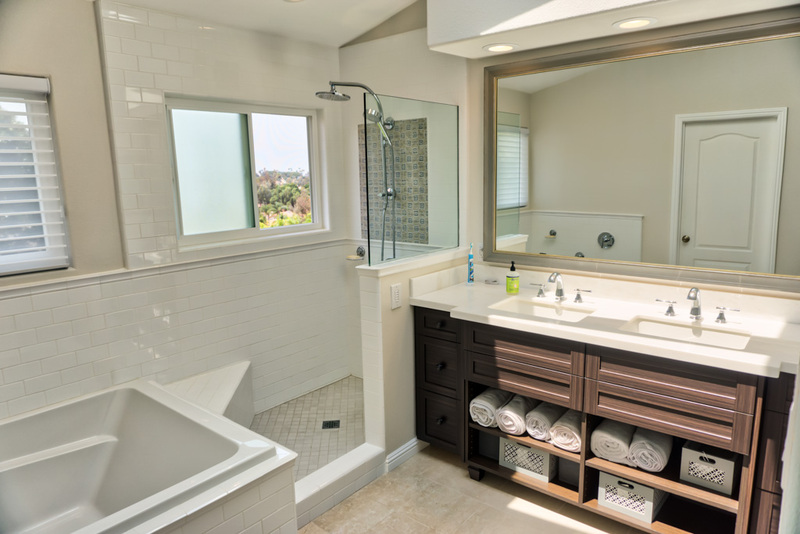 So for years, they only used the tub in this master bath while showering in another bathroom. 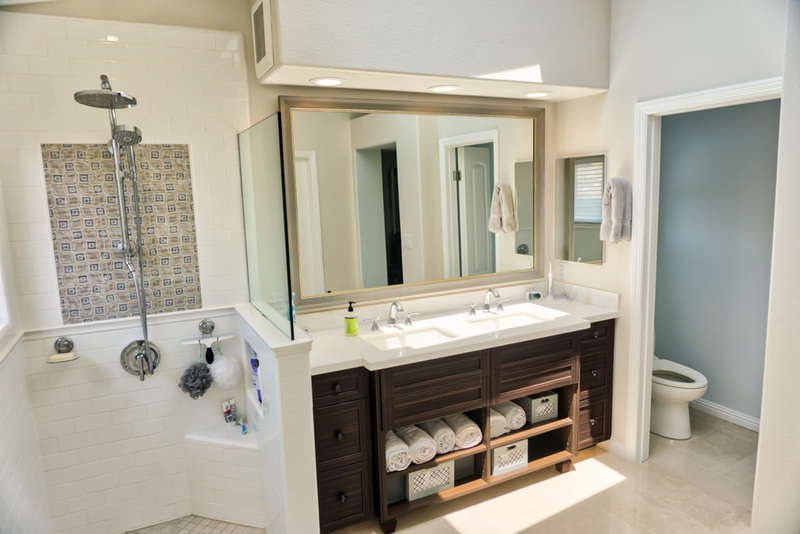 The builder’s original concept in this master bath was not bad. It had vaulted ceilings, large windows, and large skylights, all bringing in lots of light. 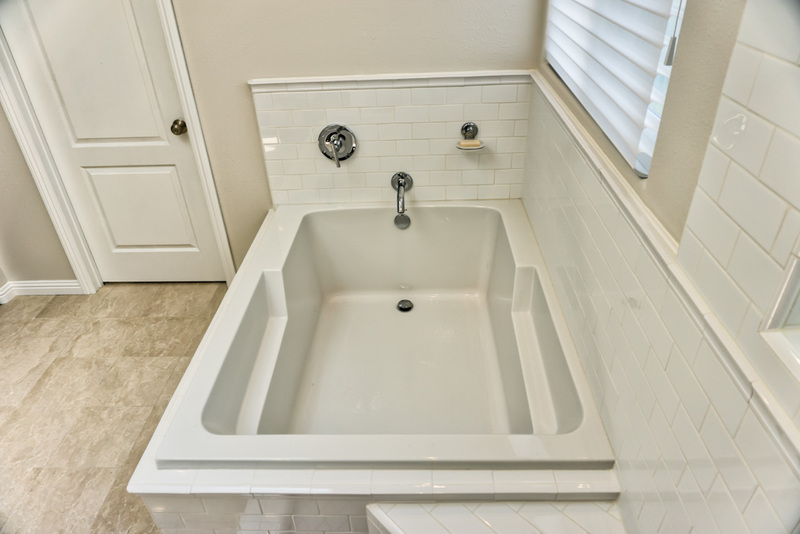 The builder just skimped on the quality of workmanship and materials, which made everything in this bath fail in less than 15 years. The work was done to meet the minimum building code standards by with one exception: the drain used did not have weep holes, which is not to code and made the other minimal standard adherences to fail prematurely. The result was major structural damage to the home that was not discovered until revealed by the demo of the tile installation. These clients are a young couple, the husband and his brother are very handy guys and wanted to do some of the work themselves to help save on costs. They began the demo and found the structural damage, then fixed it with some feedback from me. Then I completed the rest of the job. The clients’ first criteria—a working shower—was accomplished with my functional bath design concepts of a walk in shower with no door, large seat, pony wall with glass partition to keep water in the shower, recessed shampoo box in the pony wall so it is out of sight from the rest of the bath, a step in close to the shower, and a Kohler shower rails system with a rainhead and a handheld shower wand, with a diverter valve to switch between the two. 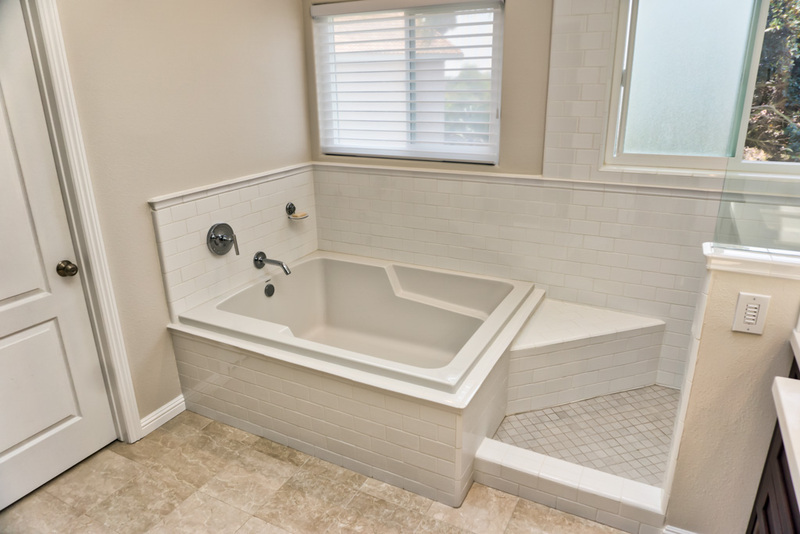 Their second criteria was a tub large enough to accommodate two people bathing at a time. The original 42” tub was too small. We went to a 48” model, which I had them find and try out in a showroom before purchasing to make sure it fit their needs and expectations. They chose to keep the crema marfil marble tile floor the husband had installed himself a few years ago (and did a very nice job on). 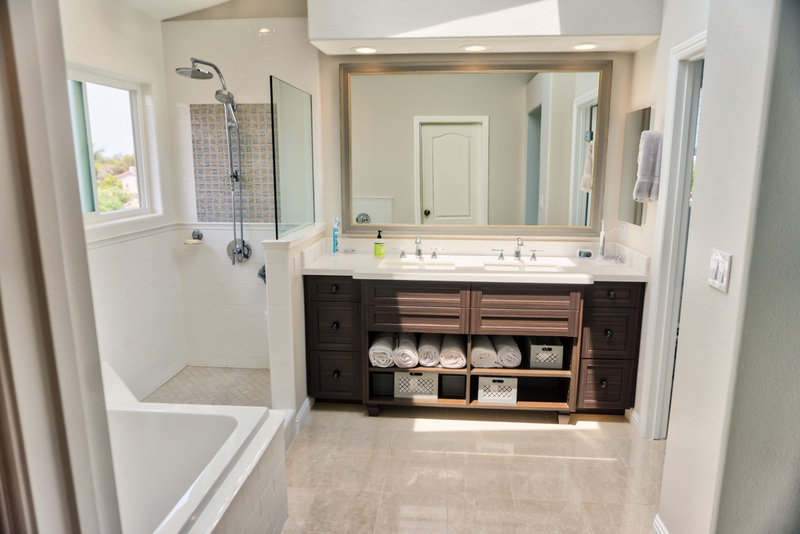 Since we made both the tub and shower slightly wider than they were before, keeping the floor was quite easy. 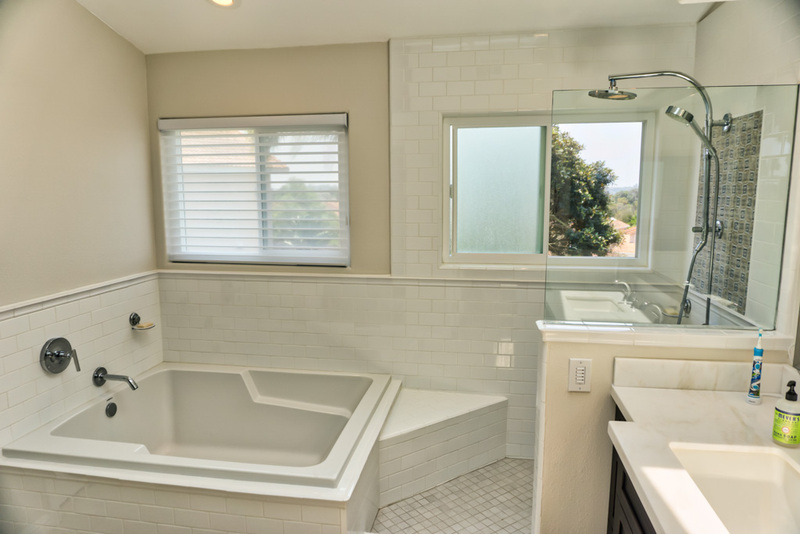 The clients chose a white subway tile for the shower and tub walls, we used a matching chair rail as a trim for the top of the pony wall and ran it all the way through the shower and tub wall and also used it on the top of the tub platform. The shower floor was a grayish 2” x 2” porcelain tile mosaic that had a companion decorative mosaic 6” x 8” recurring pattern we used to create a mural on the shower valve and head wall and on the back of the shampoo box. The mural border was a pencil liner from the white subway tile line used for the walls and chair rail. We kept but slightly modified the original soffit over the sinks, removing the old recessed florescent lights and adding LED cans. 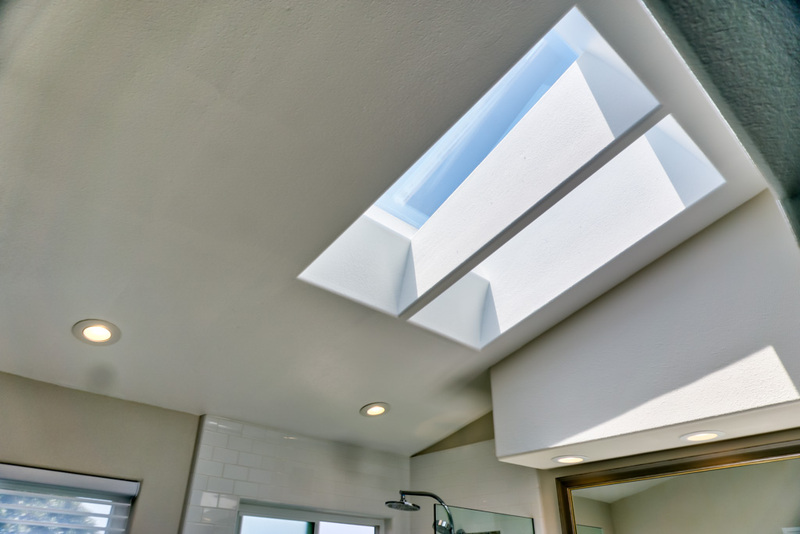 The room did not originally have a vent, so we installed an exhaust vent in that soffit area with the vent in the side wall of the soffit facing the shower. 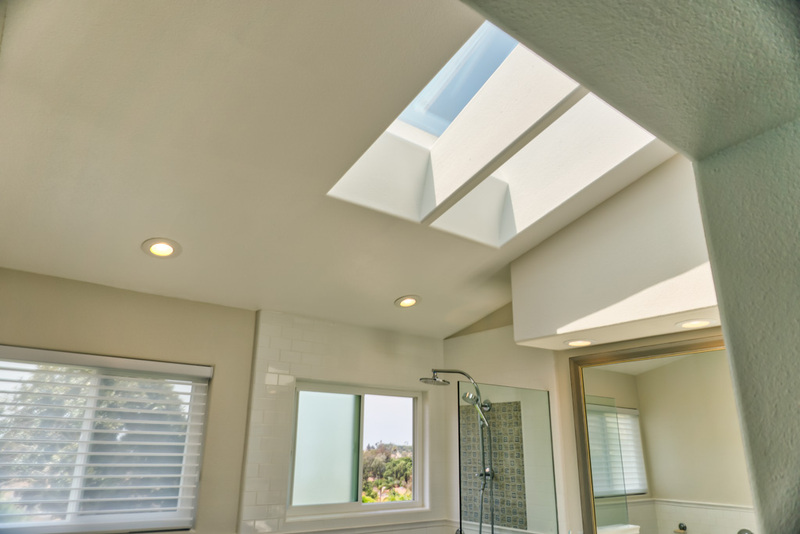 LED ceiling cans were also installed over the shower and tub in the vaulted ceiling. Those areas originally had no lighting, which was fine during daylight hours but not ideal at night. To give the room some contrast and more interest, the cabinets chosen were dark chocolate color thermofoil wood textures exteriors, with the center sink area projecting 3” further into the room than the side drawer stacks. The center sink console also has feet stained to match and open shelving at the bottom to simulate furniture rather than built-in cabinets. Lastly, the small toilet room at the right of the sink cabinets, like most their size, was awkward to enter and use, because the door swing took up the entire floor space inside the toilet room. 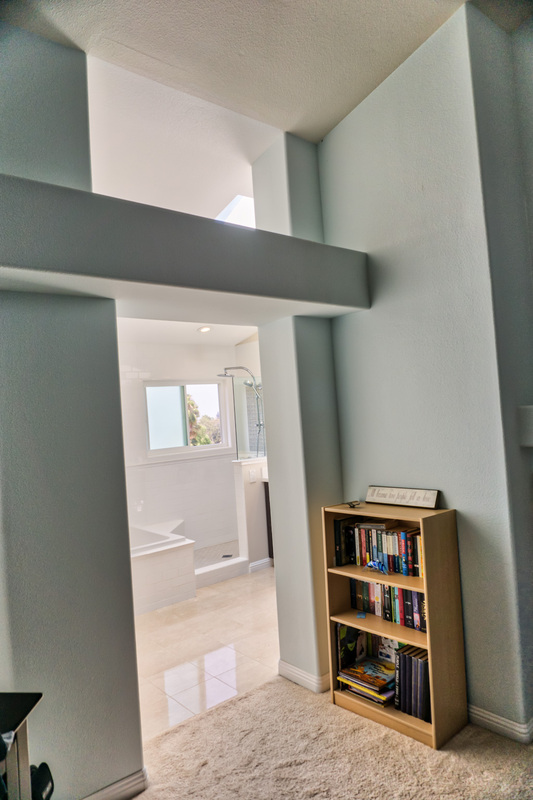 One would need to walk in, then stand between the toilet and the side wall to close the door, then do the same when opening the door to leave the room. That awkwardness was eliminated with the installation of a bi-fold door. Bi-folds don’t lock, but the original door had no lock either. 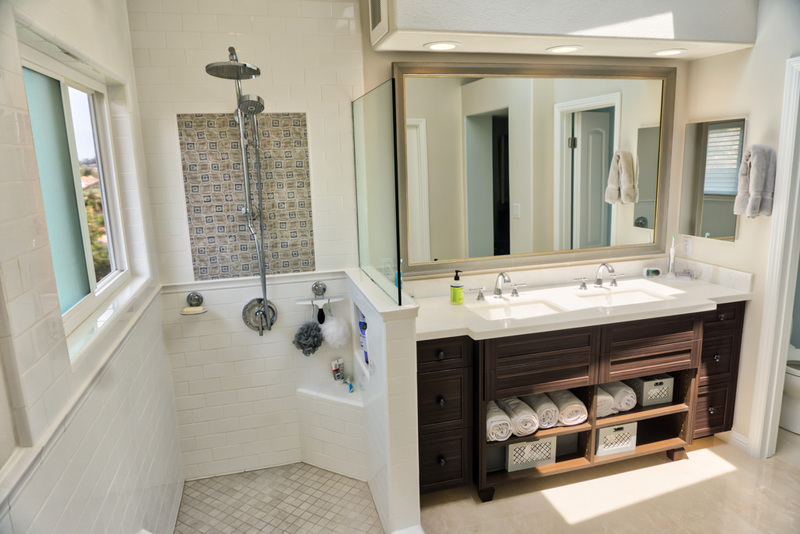 To help keep fewer things on the counter we installed a Zacca medicine cabinet in the same location as the original. 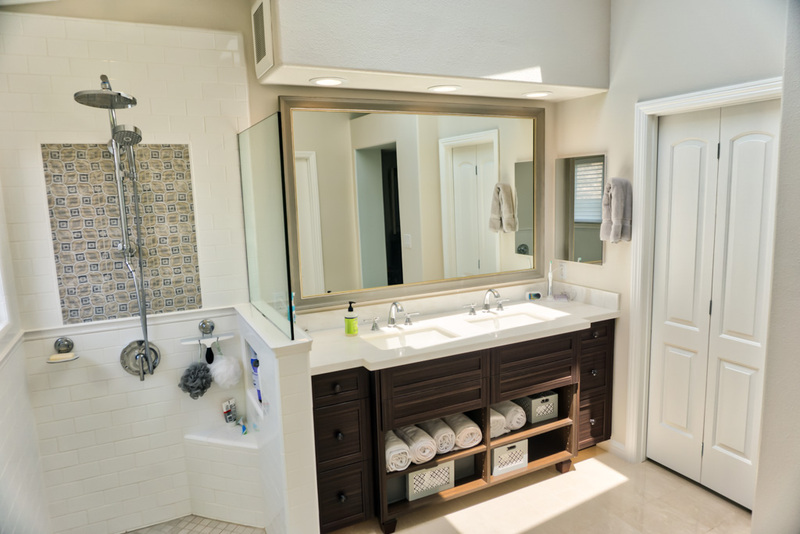 This client did not choose to have wall cabinets on each side of the sinks like we normally use. 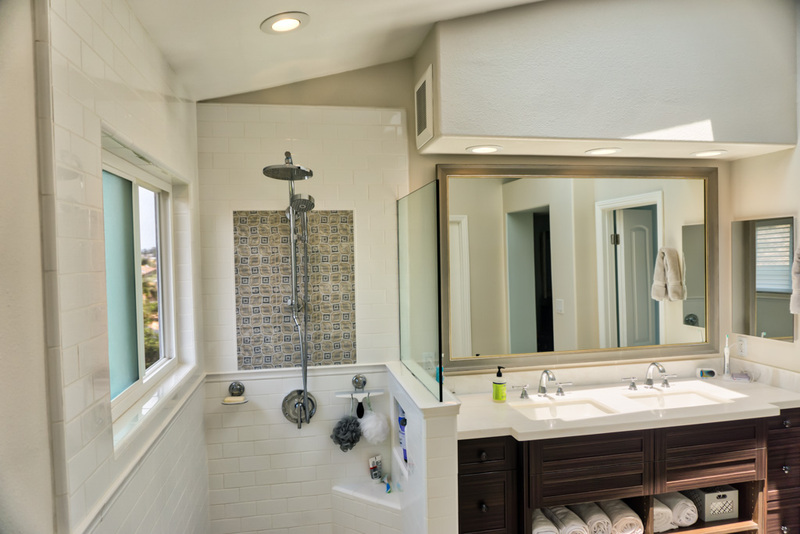 Rather than a wall-to-wall mirror, this client had a hanging mirror with frame made, which we installed for them with french cleat fasteners due to the weight of the mirror and frame. 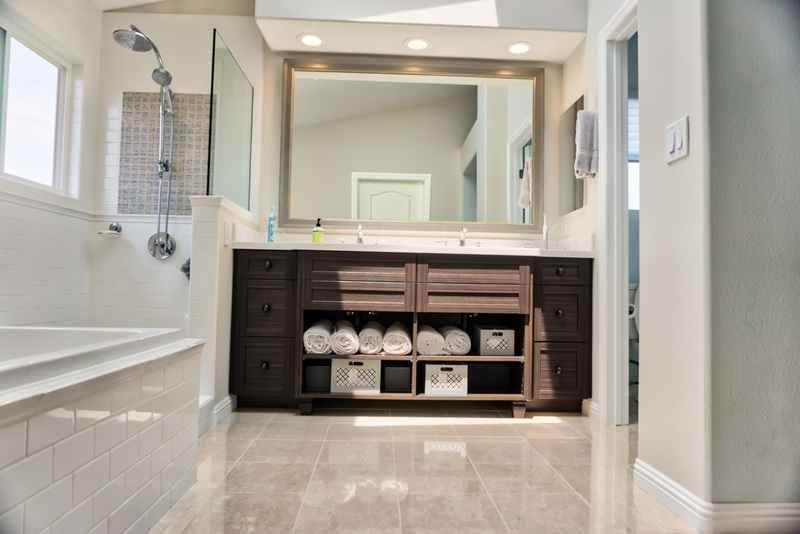 The client now has a bathroom that is stylish and will last many decades. 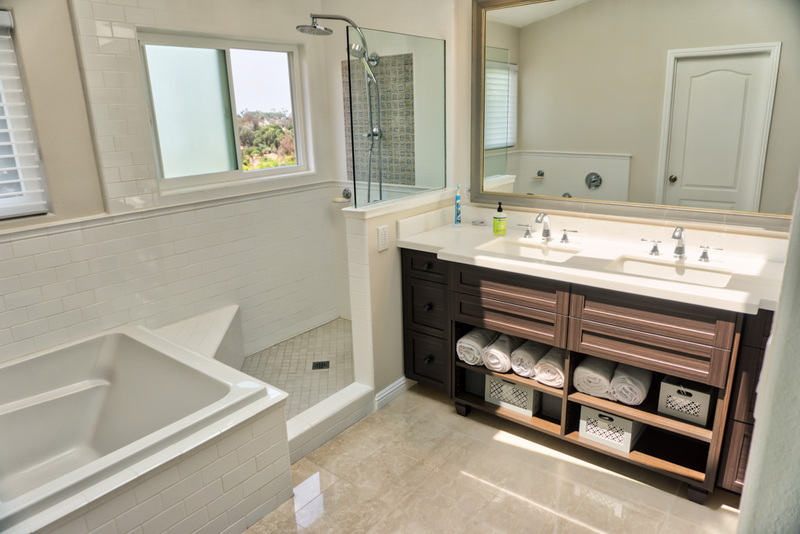 The techniques I use for shower, cabinets, and tile work have been proven to last 30 to 60 years, not 10 or 15 like today’s standard building practices and materials.